X,Y scales can be different among panels. User can choose to hide certain groups of data in the graph. Please download the data file for this tutorial. 1. 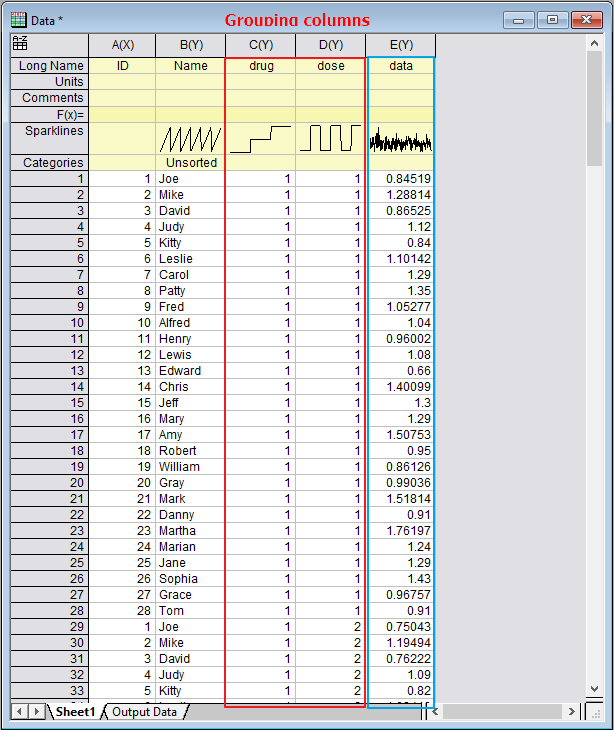 Open the attached file, highlight col(E), select from menu Plot: Cluster Plot… to open the dialog. Make the following changes in the dialog. Plot Type is set to Line+Symbol. Set col(C) and col(D) as layer separators along horizontal and vertical directions. Set col(A) as variable to color the data points. Click OK to see the result. 3. If you want to hide some layers in the graph, please click on the green lock on the upper left of the graph and select Show/Hide Layers…. 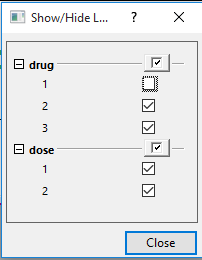 In the dialog, uncheck “1” under drug node. The layers in the graph with drug=1 is hidden from the graph. 4. Please note that the grouping columns are treated as categorical when making the plot. You can reorder the categories in grouping column in worksheet to reorganize the layers.